How Much Scarier Than the Original Will the Ghostbusters Reboot Be? 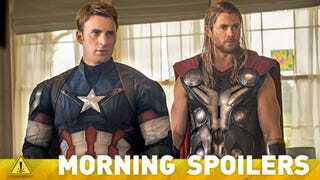 Check out some wild speculation about a major death in Avengers: Age of Ultron. A new clip shows Bruce Willis pontificating in his escaped-android movie Vice. And there's a breakdown of the differences between the movie and TV show versions of 12 Monkeys. Spoilers now! In the realm of speculation, Matt Timmy Creamer guesses that someone will die in the upcoming Avengers movie, because Joss Whedon. There's also the feeling that once the world knows ghosts and has seen them busted on such a large scale, they run the risk of becoming pedestrian. There's something fun about introducing our world, which has never seen ghosts, to the phenomenon of ghosts. I love origin stories and to introduce new characters. I want ours to be scarier than the original, to be quite honest. Katie Dipold and I are so focused on wanting to do scary comedy. We don't want to hold back. Cole still abducts a doctor named Railly and meets an insane person named Goines. But Railly (Amanda Schull) is virologist in the series instead of a psychiatrist love interest and she more actively helps Cole. While Goines is a female math wiz (Emily Hampshire) instead of a googly-eyed male animal activist (Brad Pitt). "Pitt's performance was so iconic, the series had to do its own twist. She's a bit of mercury on screen that wiggles and waggles and you can't figure out what she's going to do next." It's definitely shaping up to be a team effort, but Cas will be instrumental in 'de-marking' Dean … Getting the mark gone is an important mission for the rest of the season, and I think that that struggle is taking the fore[ground] in terms of … illness … In this stretch of the season arc, the focus is on Dean, and Cas' health is not nearly as much of an issue. Guest Cast: Morena Baccarin as Dr. Leslie Thompkins, Drew Powell as Butch Gilzean, David Zayas as Maroni, Christopher Heyerdahl as Jack Gruber, Anthony Carrigan as Victor Zsasz, Kevin McCormick as Danzig, Dash Mihok as Detective Arnold Flass, Peter Scolari as Commissioner Loeb, Adrian Martinez as Irwin, Caroline Lagerfelt as Mrs. Kean, Richard Poe as Mr. Kean, Victor Cruz as Desk Sergeant. JOHN PUTS HIS LIFE ON THE LINE AS HE GETS EVEN CLOSER TO THE SOURCE OF THE RISING DARKNESS - CLAIRE VAN DER BOOM AND EFREN RAMIREZ GUEST STAR - In order to fend off a vicious attack, John (Matt Ryan) summons a demon into himself. Chas (Charles Halford), Zed (Angélica Celaya) and Anne Marie (guest star Claire van der Boom) race against time to save John before it's too late.